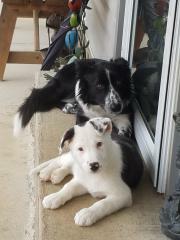 "Chillin" on my new front porch with my sister HOLLY. We both came from Lynn and Shirley Daniel's farm in Oklahoma. 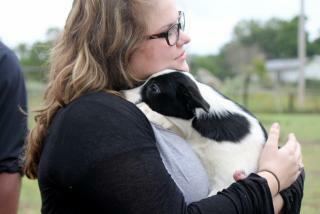 My new MOM said she fell in love with me when she saw my picture on their web page, so they came and got me. I love my new family and my sister HOLLY. Dotty..one of our pups that went to Florida owner Kathy K.
Kathy, says Dotty is awesome and learns so quickly...took her to obedience classes and she went to the head of the class!! They love her and take her everywhere they go. This little beauty is in her new home with her new family, the Burleighs. They came to our home in June of 2016 and picked Piper from Star and Leroi's litter. 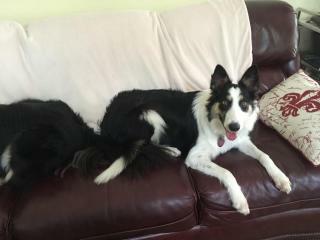 When we received the picture...the caption said "Piper is Chilling" She certainly looks happy and she is so pretty!! 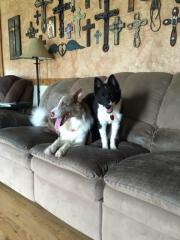 Looks like Piper has fit right in with her new family!! Thank you for sharing the picture of Piper, we love it!! Franklin's puppy all grown up. One day we get a call from the Franklin's and they said "do you remember us" we bought a puppy from you several years ago, and we want to buy another puppy to replace the one we had. We told them we do have a set of puppies, come on down and take a look. 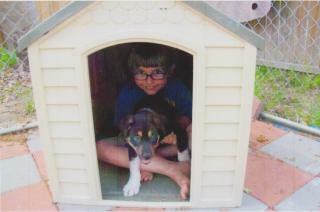 Well it looks like "Mattie" has been doing wonderful with the Franklin's, and we know she has a wonderful home. 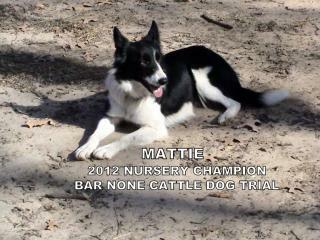 Congratulations on your training Mattie!! Christmas Card 12-15-2015. Mr. and Mrs. Charles Holt, McAlester, OK the proud owners of Coby, came for a visit a couple yrs. ago to check out our pups and left with Coby. He is a beautiful dog, great working dog. His sire is our wonderful Brett and Hope is the Mom...he is a full brother to the two pups we have for sale right now on our web page under OUR DOGS. 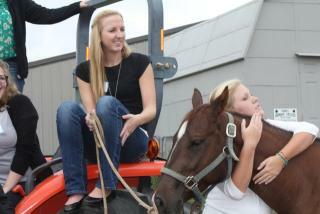 He is also full brother to Merlin, which is owned by Mr. Clay Walker. in TN. Another beautiful dog. 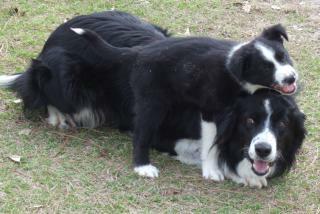 Merlin has one of his pups going to the trial this year also. 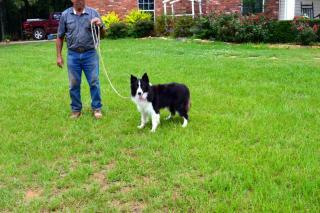 Coby will be showing this year at the Tulsa State Fair in the Cattle Stock Dog Trial. 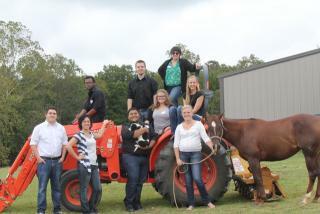 Charles uses Coby on his ranch to help with their cattle. Lynn asked Charles if it would be okay to take Coby in for a shampoo, trim and good brushing before he started on his training schedule and this is the result. Beautiful Dog!! Brody is loving his new home!! The Mays have a new family member, and I think Brody is one happy dog!! Many many happy years together!! 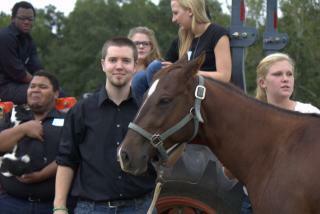 More pictures from the Southeastern OSU Choir visit. More pictures from the Choir. One day we get a call from the Music instructor from Southeastern OSU choir that they will be passing through our area, and was wondering if it would be okay for them to stop for a visit. We said sure, come on... we showed a few of our pups, horses, and worked a few dogs... a few of the guys even tried their hand at working the dogs. It was a nice visit and I think they all had a good time. 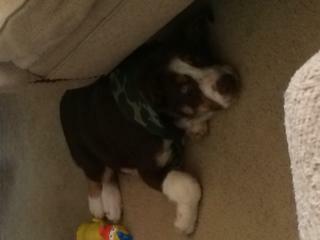 Another picture from Ms Magby and Skipper.....Looks like Skipper is having a grand time!! 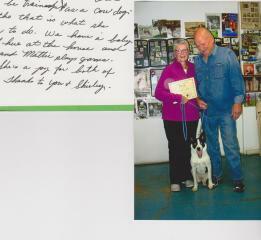 Another picture from Ms Magby and Skipper. 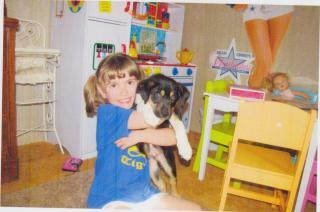 This little gal came to our place one day with her grandparents, looking for a Border Collie puppy...she fell in love with this little fellow...but he was a little young for her to take him home at that time. We suggested she wait a couple of weeks and then he will be ready. Well....two weeks later, she walked in with her little purse, and pulled out her money and said Mr. Daniel here is the money for my puppy, and I am naming him Skipper. She sent these pictures to us a few days ago, and I think Skipper has found a wonderful home!! Skipper's parents are "Pretty and Beau" they had a beautiful set of pups. Pretty has produced several winners and great working dogs. This is Beau's first litter, we are anxious to see how well they will do. 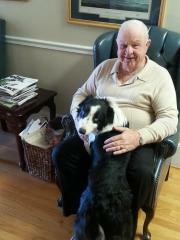 Most important, Skipper and his new owner is happy and having a great time together. 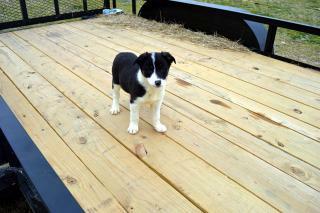 Some of our customers from Georgia sent a picture of Ace and one of his pups he sired. 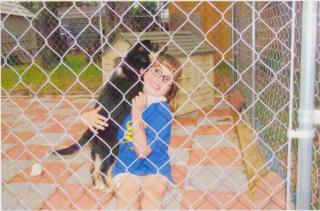 Ace was sired by our wonderful dog Brett and Babie. We are so happy Ace and his new family are having a great time together. He gets to work cattle every day. I know he is one happy dog!! Mattie comes home with red today!! Lynn and Mattie compete at Hillsboro, TX today 4-5-2014....with 20 in her class...she comes home in 2nd place!! That's my girl!! (I guess Lynn helped a little!!) Thanks Lynn, I know you guys did great!! Lynn wins at Louisiana!! 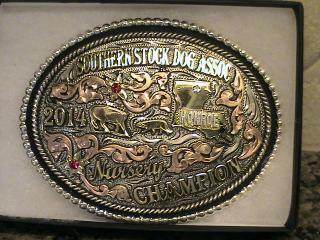 Great looking buckle!! Betty Lu did great on her way home. We got in about 8:30 . She already looks at me when I say her name. She's a happy little girl and a marvelous cuddler. 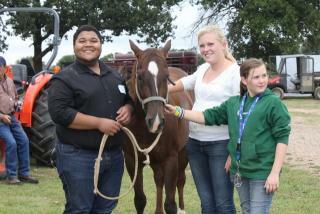 It was wonderful to meet you and to see Jake working cattle. My dad wants to come down there and meet you folks and see your dogs someday. He was invited to come yesterday and I think he's sorry he missed it when I began telling him about you and your dogs.